The Los Angeles Clippers were doomed. 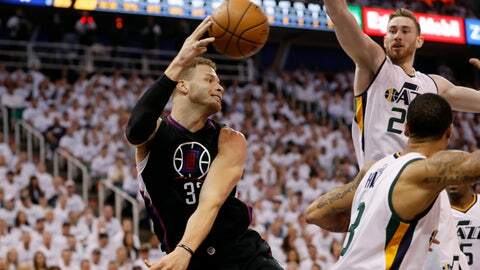 On the road, with Blake Griffin sidelined by a bruised right toe that looked far worse than the diagnosis, and the Clippers trailed the Utah Jazz by double digits. They looked primed to implode, taking the Doc Rivers era with them. But a funny thing happened in the second half of Game 3 on Friday night: The Clippers started playing their best basketball with Griffin on the bench. That’s not a coincidence. As outstanding as Griffin is, he doesn’t necessarily fit in the modern NBA ? and certainly not with this L.A. roster. The dirty truth about the Clippers in 2017 is they have a higher ceiling without Griffin than with him. He’s a redundant piece for a team predicated on the Chris Paul-DeAndre Jordan pick-and-roll. You don’t need another ball-dominant superstar who does his best work inside the 3-point line (although yes, Griffin can knock down a few triples here and there). What you need are wings who can defend and space the floor, giving Paul and Jordan maximum room to operate. To wit: Paul had 24 points in the second half and looked like the best point guard in the NBA along the way. He finished with 34 points, seven rebounds and 11 assists ? and in his postgame comments, Paul unknowingly hinted at how much better his team is without Griffin, commenting on how much space he had when Jordan rolled to the rim after halftime. So why should we be surprised the Clippers turned things around when they put Paul Pierce, Jamal Crawford and Luc Mbah a Moute on the wings? That’s how modern basketball works. Here’s the upside: Griffin probably isn’t going to be in Los Angeles much longer. He and CP3 can become free agents this summer, and they both will ? if for no other reason than to sign big raises on new contracts. Paul, though, isn’t going anywhere. He can make way more money by re-signing with the Clippers than leaving Los Angeles, because he’s eligible for the NBA’s new super-max deal. Griffin isn’t, so you have to imagine he’ll look for greener pastures this offseason. Perhaps he’ll end up with the Indiana Pacers in a Paul George trade, which would boil the blood of Lakers fans around the world. Or maybe he’ll head back to Oklahoma and partner with Russell Westbrook in a basketball marriage that makes more sense on a marquee than on the court. Regardless, Griffin would be better off elsewhere ? and if he goes, the Clippers should be right there with him to help him pack.